Not too many years ago anabolic-androgenic steroids were used by bodybuilders obsessed with creating a competitive body image or weightlifters struggling to push their bodies that bit further. In the intervening years things have changed. 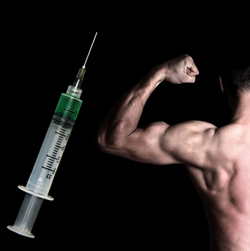 The growth of professional sport, and the sort of money to be made from it as a sportsperson when linked with steroid use, poses a significant threat to the wellbeing of young New Zealand men with dreams. Aspiring professionals, perhaps in rugby or rugby league, may see steroid use as giving them the competitive advantage when it comes to on-field performance and catching the the selectors’ eye. Ironically, the professional sportspeople they wish to emulate are unlikely to use steroids, but the impression fed to our teenage boys of the need to be bigger, tougher and faster and to have the physique to match in order to make it, is little different from the messages about body shape fed to young women for decades. And this brings me to the less-obvious casualties – the teens somewhat insecure in themselves and in their body image. These young fellows are often referred to, somewhat disparagingly, as “mirror athletes”. They might want “the look” without the workout. Or they attend the local gym to try to improve their body shape, get into a bit of weightlifting and then want something to make it all happen a bit faster or to move their bulk up a notch further. These youngsters are prime targets for the internet steroid merchant and the drug pusher in the gym. While use may improve endurance, strength and bulk, steroids haven’t been shown to improve skill, agility or athletic performance. The worry is that eventually, steroid use will become recreational and a way to look good for the summer – steroids and the sunbed. And the effects of withdrawal include violent mood swings, insomnia, loss of appetite and, most worryingly of all, depression. Steroid withdrawal has been linked to teen suicides here and overseas, and is felt to be under-reported as a significant factor. Girls tend not to be caught up in steroid use but for those who are, the long-term female-specific side-effects include facial hair, male-pattern baldness, changes to menstrual cycle, smaller breasts and a deeper voice.